Blurb: There are the old stories. And then there’s what actually happens. Lyons nailed it in every way. This book was incredible. It was visceral, the pace was fast moving and the voice especially was fantastic, especially how it differentiated between the three narrators. Kihrin is in prison. He’s being tormented there by Talon, a woman–if she still has any claim to that label–who knows a lot of his story already and is responsible for most of the heartache in it. But she’s tormenting him by asking him to recollect this story, how he got to be in his cell, help pass the time a little bit. Yet he doesn’t start at the beginning, not according to what she knows. So she starts at the real beginning, according to her, while Kihrin gives his own account. Back and forth we go between the two, learning the complicated and heartbreaking story of Kihrin through two pairs of eyes, across two different timelines, all while sitting in a jail cell waiting to be sacrificed. Of course, you can’t forget the third, who has transcribed this entire account down and has offered his own footnotes throughout the tale, listed as actual footnotes within the book. So, the way it was presented, through these three narrations, deserves nothing but a standing ovation, as it distinctly reminded me of how Rothfuss expertly messed with time and storytellers the same way, while also keeping up the high standard of intricacy and worldbuilding woven throughout this piece as Sanderson sets in his Stormlight Archive. As a debut novel, Lyons, in my opinion, is already an expert in the field. Yet Lyons story is also such a breath of fresh air and her story is still unique. Her world is vast and incredible and it was impossible not to feel the absolute depth presented here. It feels like I could reach out and visit, it’s so real and has so much history–though I’m not sure it’s a place I would want to visit, considering the circumstances. Or the events that happen in the last 150 pages. I love the characters, as well. I cheered for Kihrin the entire time and I couldn’t help but like Talon, even though I wanted to hate her. The wide company of side characters were each fleshed out and developed and everyone played a role. Some of the new races introduced here were amazing. I enjoyed learning about the lore a ton and I audibly expressed my surprise–or pain–a handful of times throughout the story. The way the story was presented–this intricate weaving of three narratives, past and present, all being told at the same time–was my favorite aspect, though. It was the intricacy level of Scott Lynch, one who I personally hold in high respect and regard; everything revealed at the perfect moment, creating the perfect balance of tension and revelation, while always making the reader continue to read without any choice on her part–even if it’s almost 3am and you should’ve went to bed hours before (oops). This book was incredible, I can sum it up simply as that. I don’t think this review does this justice, not even close. 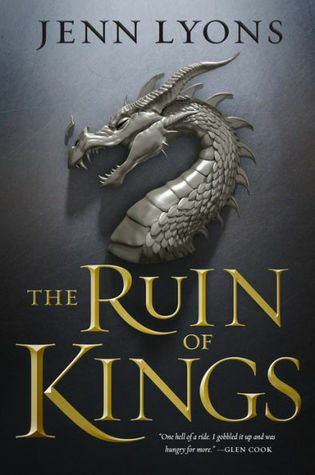 If you’re a fantasy fan, you can’t afford to miss this book (which releases Tuesday, February 5th). Lyons has been compared–rightly so–to Sanderson, Rothfuss and Lynch (at least by me). But I predict it won’t be before long before we’re comparing books to Lyons, instead. YES, it is! Have you read it yet or do you plan to? If you have, I totally missed your review! I hope you do, as well!! I’m definitely curious to hear your thoughts on it. Now reading – I admit I hadn’t realised it was 600 ish pages – hopefully, all going well I should press on in the next couple of days. I really hope you love it (and I have a feeling you’ll love it?). It’s worth the length, I think, and still leaves you wanting more by the end! Oh man! I have to pick this up now. It sounds incredible. I love the historical footnotes bit. I was aware of this book just by seeing it on some people’s lists but I wasn’t really “aware” of what it is. Thanks Nicole! I think you’re definitely going to love the way it is written. SO unique and so provocative (in the sense that it definitely causes a reaction). Can’t wait to hear what you think! Ohmygosh, why thank you, friend!! You are much too kind. I’m excited to go check your blog out, too!